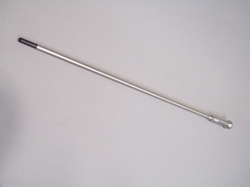 Walking stick, based on the quick change grip. The grip can be used with all possible inserts as well. Made of stainless steel with black "no wear" end piece. Does not damage the floor.